A booklet of the most ancient natural room deodoriser. 12 leaves and 36 strips. Tear off a strip, fold it into a zig-zagging concertina, set alight and blow out so it gently smoulders releasing its perfume into the air. Strips can also be placed into chests, drawers or cupboards, and I know of a French dealer in classic vehicles who likes to drop a strip into their heating and ventilation systems to imbue them with a mysterious, subtle, and pleasant scent. 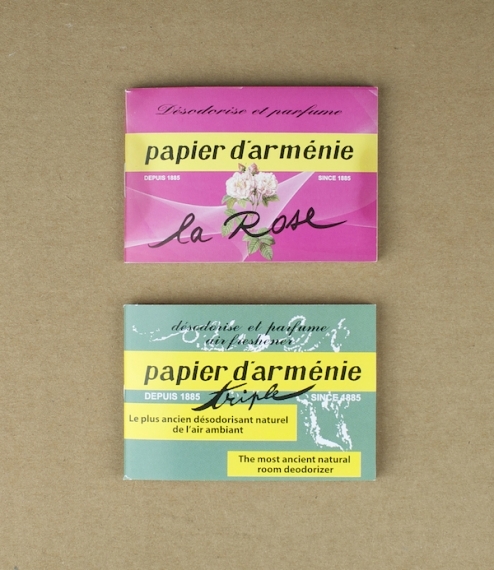 Original or La Rose with a classic rose scent.